On Saturday, April 12, 2013 it was cloudy and windy with a 50% chance of rain for Norma and Mike’s destination beach wedding … but the weather cleared just in time for the couple’s ceremony at the beautiful Sandpearl Resort on Clearwater Beach. Norma looked amazing as she was escorted by her father across the gulf lawn and down the sand to join Mike in front of their driftwood arch on the beach. There, in front of their family and friends and in a ceremony filled with laughter and smiles, the couple shared their vows, exchanged rings, and were pronounced husband and wife by Rev. Rick Lackore of Sensational Ceremonies, LLC . 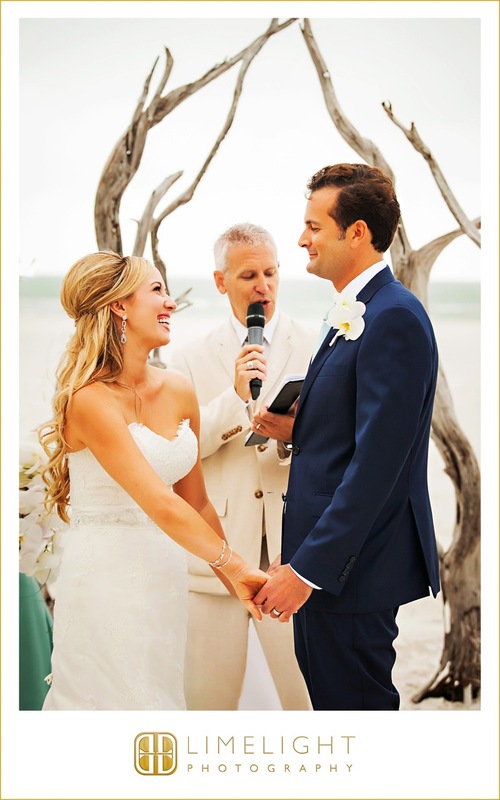 Debbie Glancy (Catering Sales Manager at The Sandpearl) and her staff did an awesome job making sure that every detail was taken care of for the happy couple and their guests. Wedding Photographer, Sarah McDonald with Limelight Photography captured the essence of their ceremony in this image. Congratulations to the new Mr. and Mrs. Mike Lucent!